Traditionally, spirituality is associated more with faith rather than experimentation. However, some spiritual teachers such as Eckhart Tolle speak the language of experimentation. In fact, Ekchart’s experiments are typically low-cost. For example, he says, “One conscious breath in and out is a meditation”. In this article, let’s explore one such experiment Eckhart suggests which I call “Catch me if you can”. Now, Eckhart’s experiment is as follows. Whenever you get into a negative emotion such as frustration or anger, you need to observe how long you remain completely lost in that state. Note that once you are lost in, say anger, there is nothing you can do about it because you and anger are not different in that state. The recovery towards peaceful mind starts once you notice, “Oh, there is that anger in me.” At what point of time such an observation happens is the crux of this experiment. The objective of this experiment (or game) is to catch yourself in the state as early as possible. Eckhart divides your "Gotcha" point into three stages. · Stage-1: You catch yourself just before you are going to become angry – perhaps you notice the trigger such as your boss’s criticism and become alert. 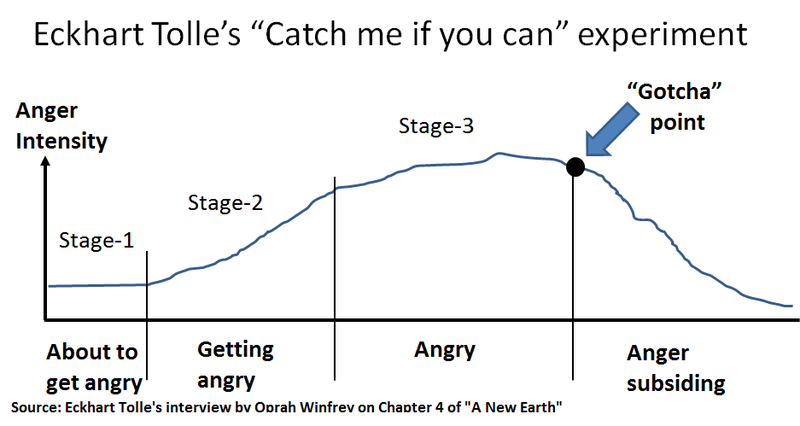 Your goal is to catch yourself in stage-1 as much as possible. Why? Because your emotion can’t sustain itself for long when you detach yourself from it. · Stage-2: You catch yourself as you are entering the state i.e. you catch yourself getting angry. Perhaps you can’t do much about it and you get angry anyway. Perhaps the awareness subsides the emotion before it takes off. · Stage-3: Like Dimitry, you catch yourself in the state (say anger) after some time. It could be a few minutes or as much as a week after you enter into the state. This is when most of us become aware of our emotional state. For example, the last time I got angry was when I was standing in a payment queue at Adiga restaurant on M G Road and one person just barged in and went directly to the counter. I got angry and told him to stand in the queue. He did. And within a minute I became aware of my anger and it subsided 10-15 minutes later. It was a stage-3 observation i.e. catching myself in angry state. Could it be in stage-2 next time? Let’s see. I see following challenge in extending this experiment. It may work for extreme emotions such as frustration or anger. Could it also work for low-intensity emotions such as anxiety? How easy will it be to catch yourself getting anxious? I don’t know. Any ideas? Source: Primary source for this reflection is Eckhart’s interview by Oprah Winfrey on chapter 4 of Eckhart’s book “A New Earth”. Dimtry’s question starts at 53:10. A similar question was asked by Dionne from Port of Spain, Trinidad at 44:06. Unfortunately, the video is no longer available online. Interesting experiment. Worth trying. Thanks for sharing. I found a practical way to experience this .. In the morning traffic when I was stuck in a jam behind a signal, I realised that engine is running un-necessarily. I switched it off - only to have it start again as the traffic started moving. So when you get to a standstill in a traffic if you can be aware, you can switch off the engine in time and save petrol (and in turn money!). That's the plan now for some time - once I get handle on that then next goal would be to track 'negative' emotions! Overall a good technique - Thanks again. This is cool. Applying this to catch yourself before being anxious would be nirvana. Anxiety is not as clear as anger, hence difficult to know and catch. I am hoping wearable devices can catch variation in body temperature, sweat and hear beat to indicate anxiety.